Both brick-and-mortar banks and cutting-edge fintechs compete to deliver a superior credit card customer journey. The reasons are simple. For a bank, it’s all about retention, monetizing the expense of onboarding a new customer, and cross-selling. For a fintech, it’s about reducing churn, keeping pace with full-service banks, and going after new generations of customers who don’t step into retail branches. For both, it’s about serving customers in the age of easy and reliable self-service e-commerce, where the bar is set high—and recognizably—by companies like Amazon. 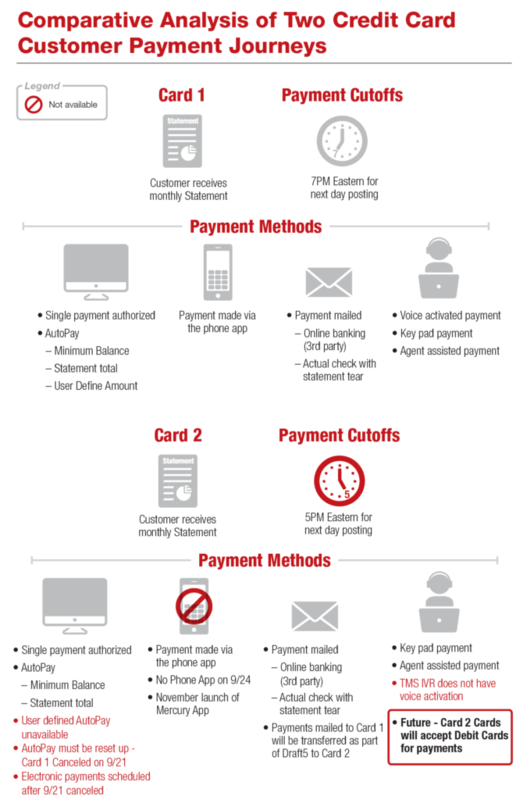 Credit card customer journey is defined as the sequential process steps and touch points that a credit card customer of a bank, credit card company, or fintech, experiences throughout their life-cycle as a prospect, or customer. The following credit card customer journey case study concerns a firm that was processing multiple types of branded cards. They called in The Lab to identify gaps in the customer journey, and opportunities for improvement. And while the company in this case study is a fintech, the facts and findings apply equally to banks. It’s common knowledge that the ability to improve the credit card customer experience depends on data. This client, like many in the banking industry, was concerned that they didn’t have enough of it. Yet, like many banking-industry clients we serve, we found the opposite to be true: They had plenty of data. They simply weren’t scouring, cleaning it, or applying it properly. Specifically, they never did what The Lab routinely does: Document and map customer processes, throughout the journey, down to the individual activity level. They had data. They had opinions. They had silos. But they had never looked at the journey from end to end. We did. The first order of business was identifying all of the discrete customer touch-points in their journey. We identified each one. We created a metrics landscape (this client never had one before). Importantly, we categorized the activities to make the project manageable. We were able to cluster hundreds of activities into just a few important classifications, such as automation opportunities, policy issues, regulatory concerns, systems functionality, and so on. 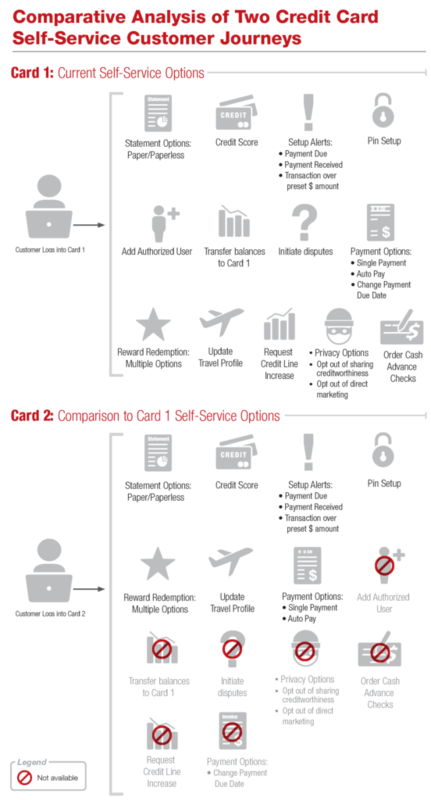 Next we performed a credit card customer journey gap analysis. This is the essential step for summarizing and prioritizing next steps. Based on the gap analysis, we were able to advise the customer on the migratory path they’d need to traverse in order to compete at the highest level, maximizing customer retention and minimizing costly churn. Here’s a single example: New customers to this fintech had already provided the company with their checking-account information for ACH (automated clearinghouse) processing of their payments. Yet when these same customers applied for a new credit card, they were asked to start all over again, providing a voided check to set up the ACH which they had already set up previously. For the customers, this was frustrating. (For some, it was deal-breaking.) For our client, it was an unfortunately common problem among fintechs and banks alike: If, say, a customer’s bank wants to sell them a credit card, they may well already have that customer’s information from their home-equity loan. But the two departments don’t talk to each other and synchronize their customer-experience activities. The customers get frustrated (“Why are you contacting me so many times to get information you already have from me?”), while the banks lack visibility into why the customers get frustrated—or leave. Onboarding is the linchpin initial interaction which all banks and fintechs must master; without it, there are no customers to serve. This is one area where banks and fintechs diverge. Banks have more regulatory hurdles to clear for screening for things like behavior patterns that can trigger follow-up to comply with anti-money-laundering regulations. Still, customer journey maps can come to the rescue here: If too many (or too few) prospects get flagged (as revealed by the data), the bank can consider, quite reasonably, whether it’s interpreted the regulations too tightly or too loosely, respectively. Again, this all goes back to mapping out the customer touch-points in their credit card customer journey. Lacking this data, banks and fintechs alike are traveling blind—and asking their customers to do the same. Is your bank’s targeting of credit card prospects and customers effective? Are your outbound communications clearly crafted? Are you soliciting customer feedback to your materials via surveys or other means (see sidebar)? Are you tracking emails and texts to see if they’ve been opened and/or read? Have you established a campaign to reach prospective customers—and do you have the team in place to process the results? These are the kinds of questions we posed to our client—and helped them to answer, too. For example, they needed to track the effectiveness of their credit card customer journey targeting. They needed visibility into their backlog of new activations; after all, none of those prospects become paying customers until they’re approved. Clearly, there’s a lot of data at work here. Fortunately, modern business intelligence and analytics systems that sit on top of core systems can easily crunch a lot of input from multiple sources and generate dashboards based upon the synchronized data. The Lab was able to help the client with this challenge, too. Today’s customers want as many options as possible. And so do banks and fintechs: If they fail to provide these options, they won’t measure up, and customers will move on. Put it this way: If you don’t allow your customer to log in to their account via Facebook, you can count on getting flamed by that customer… on Facebook. That’s a lose/lose: It costs you a customer and dings your NPS numbers and brand reputation, all at the same time. “Multiple options” is part of the “seamless experience” challenge of creating the ideal customer journey. Can your trusted third-party vendors provide all the functionality that your customers expect from your brand? If not, that’s a gap to plug. Customers recognize when they’re put on hold or their transactions are delayed while one silo tries to contact another. Thus all the tools and functionality of your website, app, and social-media interface must all “just work.” These are vital gaps that must be identified. These problems are insidious. Too many times, especially in the credit-card realm, customers will “kite,” or max out, their credit cards, and move on to another one if they experience bumps in their customer-experience journey. And all too often, banks and fintechs are left in the dark, not knowing what they’ve done wrong (“Why are so many new customers leaving us after three months?”), nor how to fix it (“What must we do to keep them happy and paying?”). Considering the high costs of credit card customer onboarding, it’s a price you can’t afford to pay. Too many banks and fintechs today regard their call centers as a cost center and a burden. Nothing could be further from the truth. Here at The Lab, we firmly believe that call centers are worth far more than they’re credited. Why, after all, pay for costly market research when you’ve got proven customer-experience data coming to you daily? Your own customers are calling in. They’re ready and willing to share their concerns with you. The only hurdle—and it’s a common one, unfortunately—is putting the info into the hands of the people who can use it. For companies like our recent fintech client, payments represents the highest hurdle along the credit card customer-experience journey. Put simply, the easier you make it for your customers to pay, the more success you’ll enjoy. Do you know their preferences? Can you serve them accordingly? Do they prefer a mobile app? iPad? Social media? Apple Pay? Understanding who they are is invaluable. For subprime borrowers, for example, the simple (yet counterintuitive) addition of a five-day grace period can boost retention. The same applies to time-of-day for processing payments: If you wait until midnight, instead of, say, six pm, to process payments and avoid overdraft fees, you can keep these customers happier, longer, and more profitably. The same issue applies to the seemingly-simple task of providing customer notifications; the timing is crucial. And different systems and vendors have different requirements; it’s your job to understand their nuances, and use them to tailor the ideal experience for your customer. Keep track of all payments that get rejected—and why. Look for rejected emails, addresses, and electronic kickbacks. Monitor complaints; develop dashboards to detect addressable patterns. Track KPIs such as percentage of online profile completions and activations. This isn’t merely a matter of copying others. By documenting and scrutinizing the end-to-end credit card customer journey, you can find opportunities to create and deliver novel, even breakthrough, experiences that take you far above the competition. The Lab can help. Contact us today for a no-obligation 30-minute demo.